Kim Fundingsland/MDN The Souris River remains well below its banks at the Boy Scout Bridge location west of the city. Runoff this year has been historically low with peak flows reached several days ago. This photograph was taken Wednesday. Even though ice remains on some area rivers, it appears that the peak of spring runoff has already occurred. River flows have sharply declined from what they were just a few days ago. Due to a spring whose arrival was stubbornly late, so too was the snowmelt. 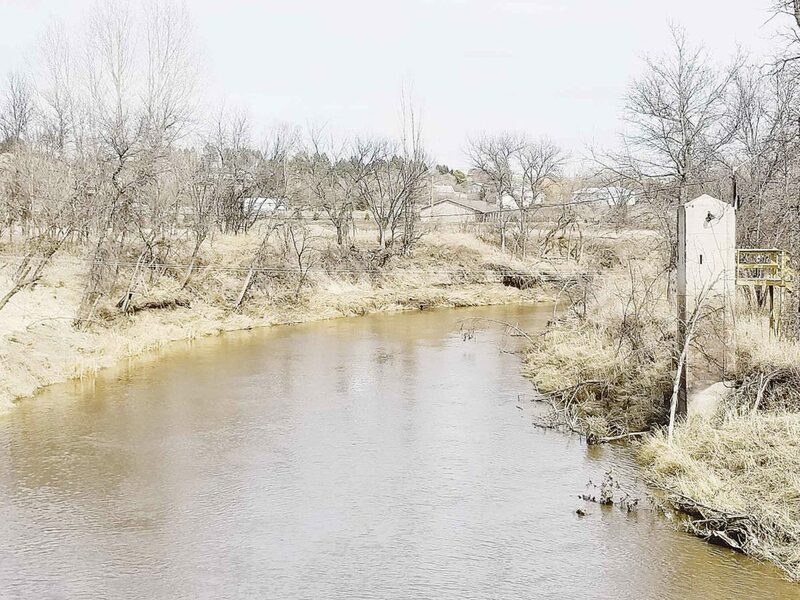 Historically, more than 50 percent of the time, Souris River runoff has peaked about April 19. This year it was several days later and slipped downstream virtually unnoticed. By and large, all snowpack is gone from the fields and coulees that drain into the Souris. River flows that rose slightly a few days ago have dropped off considerably. At Lake Darling Dam a scant 10 cubic feet per second is being released into the Souris River with no current plans to increase flows. That’s because Lake Darling remains below its preferred summer operating level of 1,597 feet with a historically low amount of water entering the reservoir. A mere 144 cfs flow is currently in the Souris above Lake Darling. As expected, the water level of Lake Darling has been climbing very slowly. It reached 1,596.6 feet Thursday, a gain of less than half an inch in seven days. That compares to many years when runoff into the reservoir resulted in increases of six inches or more in a single day. The gauge on the Souris River near Bakers Bridge registered less than 10 cfs Thursday. That compares to a long-term median of 645 cfs for the same day. At the Boy Scout Bridge just west of the city, the Thursday flow was 151 cfs and dropping. The Des Lacs River at Burlington was reading 64 cfs Thursday, much less than what it was a few days earlier. Furthermore, observers say there’s little or no snow remaining in North Dakota or southern Saskatchewan to contribute to further runoff into the Souris and Des Lacs basins. Notable too is that several reporting points remain encased in ice, including the Wintering River near Karlsruhe, the Souris River near Bantry, Deep River near Upham and Willow Creek near Willow City. Willow Creek is a vast drainage that includes a large portion of the Turtle Mountains and is often responsible for adding substantial flows to the Souris River. There is no gauge to monitor flows in the Souris River through Minot, but movement of water is far less than usual for this time of year. The river is ice free with the exception of broken ice in some of the cut-off oxbows inside the city. The minimal flowage over a few of Minot’s coffer dams is the result of local runoff which is quickly coming to an end. The Souris is expected to rise in the coming days at Westhope, the furthest downstream reporting point on the river in North Dakota. Normal flows at Westhope for this time of year is 1,340 cfs. The gauge there was reporting less than 3 cfs on Thursday. Part of the reason for the limited cfs at Westhope has been the diversion of Souris River water needed for the Eaton Irrigation Project at Towner. That commitment has been met and water is flowing in the Souris downstream of Towner once again.